Cooperative societies play a very major role in financial intermediation in Kenya and this ensures that the members of the cooperative are empowered economically and they are able to invest some of their savings in the economy. A cooperative society thus has to grow so that this can be realized and it is because of this reason that the researcher found out the various factors influencing growth of Saccos in Nairobi CBD. This research examined the factors that lead to the growth of co-operative societies in Kenya. The study was a case select of Saccos in Nairobi CBD, and adopted descriptive research design. This design showed the overall pattern or framework of the project that stipulates what information was collected and from which source and by what procedures. The research looked at the following objectives; to find out the effect of capacity building on growth of Saccos in Nairobi County; to analyze the effect of innovation on growth of Saccos in Nairobi County; to access the effect of technology on growth of Saccos in Nairobi County; to determine the effect of management skills on growth of Saccos in Nairobi county. The target population of the study was 1150 Sacco employees currently in the area. Data was analyzed from the sample size of 115 respondents. The data was analyzed through various statistical methods such as mean, frequency count and percentages through the use of graphs and pie-charts for ease of reference and interpretation of the results. Ethical approval was sought from the relevant ethical authorities. Co-operative society: An autonomous association of persons united voluntarily to meet their common economic, social and cultural needs and aspirations through a jointly owned and democratically controlled enterprise, (Manyara, 2003). Growth: Refers to increase in membership, savings, loans granted, surplus/profits, number of products/services offered to members, (Crowsby, 1990). In this chapter the researcher discussed the background of the study, statement of the problem, purpose of the study. Objectives of the study, research questions, significance, limitations, assumptions and give the scope of the study. This study sought to investigate factors influencing growth of co-operative societies in Nairobi County using a case study of Sacco’s in Nairobi cbd.This study found out whether capacity building, innovation, technology and management skills led to the growth of cooperative societies. According to international cooperative alliance recommendation (1995), a co-operative has been defined as an association of persons who have voluntarily joined together to achieve a common end through the formation of a democratically controlled organization, making equitable contributions to the capital required and accepting a fair share of the risks and benefits of the undertaking in which the members actively participate. It can also be defined as an autonomous association of persons united voluntarily to meet their common economic, social and cultural needs and aspirations through a jointly owned and democratically controlled enterprise, (Manyara, 2003). The research attempted to ascertain, if a Sacco as an enterprise, which operates in an economic environment just like any other business entity, desires growth not only for survival, but also for its prosperity. In a co-operative enterprise, the members learn the principles of democratic governance, transparency and their involvement in management of a collectively owned enterprise (Kobia, 2011). Kobia further says that co-operatives have a unique advantage in addressing problems of poverty, wealth creation and its equitable distribution; social wellbeing and transformational development of communities and society in general. He further observed that co-ops have helped to build the economies of the developed world and can be used to a greater extent to expand and transform the economies of developing countries such as Kenya. Globally according to the international cooperative alliance there is about 1 billion members. The country with the largest number of cooperatives is the United States with like 30,000 cooperatives. In Kenya, 63% of the population derives their livelihoods from co-operatives. The number of registered cooperatives in Kenya is approximately 15,000 with 12 million members with over 300,000 employees. (WOCCU, 2013).The total number of Saccos had risen with a 5.4% growth from 4,228 in 2011 to 15,000 cooperatives in 2013. This in turn results to more memberships, savings, and surplus among the cooperatives in Kenya. Co-operatives growth has been found to have a significant impact on national economies as they provide employment and savings especially among the economically marginalized. Cooperative societies are crucial in the growth of the economy and sustainable growth of every country. Communication technology thus making it necessary for it to refocus and re-assess its capacity not just to mobilizing financial resources further, but also to manage them well for faster economic growth (Gunga, 2008).As per the co-operative Society Management and Prudential Guideline Manual (May 2008), there is need to entrench performance based culture in the management of co-operative societies. The Sacco Regulatory Authority (SASRA) observes despite the rapid growth that has seen 218 Saccos out of the 5,544 registered Saccos taking deposits from members, there are challenges that need to be addressed. The researcher has observed that Saccos face challenges of capacity development, low levels of innovation low uptake of information technology and low level of professional skill development in management in both senior and junior staff. Following the research problem stated above, the general objective of this study was to examine the factors that lead to the growth of co-operative societies in Kenya. To find out the effect of capacity building on growth of Saccos in Nairobi county. To analyze the effect of innovation on growth of Saccos in Nairobi county. To access the effect of technology on growth of Saccos in Nairobi county. To determine the effect of management skills on growth of Saccos in Nairobi county. 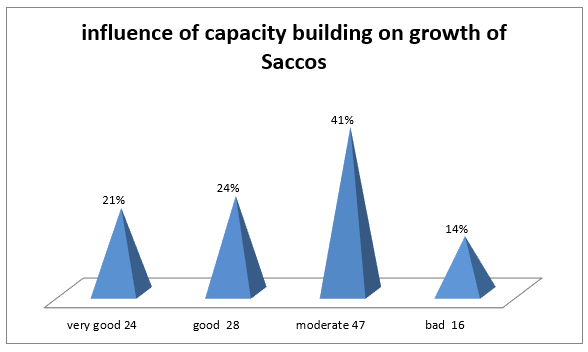 What is the effect of capacity building on the growth of Saccos in Nairobi County? To what extent does innovation influence the growth of Saccos in Nairobi County? How does technology affect the growth of Saccos in Nairobi County? How do management skills affect growth of Saccos in Nairobi County? This research was conducted to determine the strategies that lead to growth of co-operative Societies and how the growth affects this particular entity. The findings of this study are going to help co-operative societies to determine critical strategies that are going to enhance growth of the Saccos. The research will help policy makers for example government officials because they would be able to develop sound policies based on the findings of the study. A limitation of any survey research is the inability of to ask follow up questions and explore in more depth the reasoning behind any finding. Limitations here in this research were financial constraints in that the printing charges were so much for me considering that I am a student. The other limitation was that I did not have much time to gather the much needed data. I dealt with this limitation by ensuring that I have gathered enough money so that I can print more questionnaire papers and also by carrying out the research within the specified time to avoid time constraints. Delimitation is to establish the limits or boundaries of. The delimitations that I found in this research project were in determining the sample size there can be a great margin of error but I had some control over this in which I took a larger sample with the understanding that this reduced the margin of error. According to Bogdan and Biklen(2003),Conceptual framework is a basic structure consisting of certain abstract blocks which represent the observational, the experiential and the analytical or synthetical aspects of a process or system being conceived. It is a set of broad ideas and principles taken from pertinent fields of investigation and used to create a subsequent presentation. The interconnection of these blocks completes the framework for certain expected outcomes. A variable is a measurable characteristic that assumes different values among subjects (Bogdan&Bilken, 2003). Growth which is a dependent variable in this study is influenced by the following independent variables like capacity building, innovation, technology and management skills. Capacity building. Leadership development is a key business strategy, and that leaders are developed primarily on the job (Kinicki& Williams, 2008).Training of leaders in a cooperative society enhances growth because they are able to manage it well. Innovation. Is anything that is new to a business or as comprising new products and processes and significant technological changes of products and processes (Hine &Kapeleris, 2006).When a certain Sacco introduces an innovative project it may attract members because many members tend to compare the various products offered by different Sacco’s. Technology. New technologies create new markets and opportunities, and every new technology replaces an older technology (Kotler & Armstrong, 2004). This chapter reviewed relevant literature information that is related and consistent with the objectives of the study. Important issues and practical problems were brought out and critically examined so as to determine the current facts. This section was vital as it determined the information that linked the current study with past studies and what future studies will still need to explore so as to improve knowledge. Helmberger and Hoos (1962) can be regarded as having developed the first complete mathematical model of behavior of cooperatives. According to(Sexton,1995)who provides a brief overview of developments in the economic theory of cooperatives uses the neo-classical theory of the firm to develop short-run and long run models of a cooperative including behavioral relations and positions of equilibrium for a cooperative and its members under different sets of assumptions using traditional marginal analysis. In their model, the cooperative’s optimization objective is to maximize benefits to members by maximizing the per unit value or average price by distributing all earnings back to members in proportion to their patronage volume or use (Torgerson, 1998). Sexton (1995) regards this landmark paper so highly because the correct analysis of cooperative and member behavior is based on a clear set of assumptions; the model clearly distinguishes between short and long-run behavior in a cooperative; and based on these characteristics, the model set the stage for further advances in cooperative theory in the 1970s and 1980s.The theory of cooperatives is in relation to the growth of cooperative societies because it states that the maximum objective of the Saccos is to maximize the unit value of all earnings back to the members of the cooperatives thus enhancing their growth. According to (Royer, 1999) agency relationships exist whenever an individual or organization the agent acts on behalf of another the principal. Principal-agent problems arise because the objectives of the agent are usually not the same as those of the principal, and thus the agent may not always best represent the interests of the principal. The terms of an agency relationship are typically defined in a contract between the agent and the principal which could bind the agent to act in the principal’s interests. Because contracts are generally incomplete, there are opportunities for shirking due to moral hazard and imperfect observability. (Royer, 1999). Hence, the main focus of agency theory is on incentive and measurement problems, but the risk sharing implications of incentive contracts are also crucial. Sykuta and Chaddad (1999) point out that most applications of agency theory focus on the incentive vs. risks having trade-off of contracts aimed at aligning the interests of the agent with those of the principal. Agency theory is thus very relevant to the institutional structure of cooperatives because employed agents who are the managers may not act in the best interests of cooperative owner-members otherwise known as the principal. The challenge, therefore, is which ownership and capital structures can be developed to lower agency costs. Principal-agent problems in a cooperative are likely to give rise to member dissatisfaction. Cooperatives experience greater principal-agent problems than proprietary firms due to the lack of capital market discipline, a clear profit motive, and the transitive nature of ownership. If the cooperatives avoid the agency problem then the Sacco is going to have a clear profit motive thus good management by the agents of the Saccos thus enhancing its growth. Excellent executives look to the future and prepare for it (Koontz and Weihnrich, 2007) and that one important way to do this is to develop and train managers so that they are able to cope with the new demand, new problem, and new challenges. They continue to say that the development of managers is very essential because the development in the long run helps to equip managers with essential skills to learn how to manage as well as learning to do their jobs better. According to (Pearce,2007) leadership development and training is the effort to familiarize future leaders with the skills which in the long run is going to impart them with the efficient skills that will enhance the efficiency of the managers of the organization thus influencing the growth of Saccos. When an organizational leader has undergone capacity building and then goes ahead to acquire the following skills this makes sure they are hands on in their jobs thus accelerating growth of the Sacco. When a sacco has undertaken the role of capacity building among its employees then this brings about competitive advantage over rivals. When the leaders of the organization have been developed by the organization itself through the process of capacity buidling they accuire some seven pronciples of leadership. (Kinicki and Williams, 2008).They further continue to state that these seven principles of leadership include the following innovators,motivators,strategic decision makers,global managers,change agents,strategies and finally we have collaborators.This seven principles of leadership are going to make the business to thrive and prosper thus in this case accelerating the growth of saccos.According to the (Co-operative Societies Act, 2005) the government of Kenya is responsible for cooperative education and training and this includes educating and training the employees and management of the Saccos to ensure that their productivity is evident. This is in line with the internationally accepted co-operative principle of co-operative education, training and information. The training therefore will ensure that the managers and employees of the Sacco govern it using the right skills will in turn lead to the growth of the Sacco.According to (Armstrong, 2003) training of employees should be conducted so that the employees can be competent and improve their performance in the organization. Armstrong further notes that training is very crucial in an organization because it enhances the growth of employees in an organization so that the future human resource needs will be met from inside the organization without having to source employees from outside. This is introduction of new products or services; usage of new methods in product or service delivery; or application of better technology in processing or delivering a service or product (Hine and Kapeleris, 2006).When a Sacco has more attractive product compared to another Sacco or even other Sacco which are attractive this means that the Sacco that has more innovative products is going to have some competitive advantage over the other Saccos. This is because the Saccos offering more attractive products is going to raise members expectation of Sacco products and therefore move to the more attractive Sacco. According to Mudibo (2005), the major financial decisions involved in financial stewardship include product innovation, Fosa, activities among others. Saccos develop various loan products as a form of innovativeness and this in turn ensures that members of the Saccos are satisfied because the loan products meet their needs. Saccos should, therefore, design proper mechanisms so as to enhance innovativeness which leads to variety and quality loan products hence growth of Sacco’s wealth. There is a positive relationship between innovation and the growth of Saccos. A company that overlooks new and better ways to do things will eventually lose customers to another company that has found a better way (Kotler and Armstrong, 2004). The Saccos in Kenya especially the ones in Nairobi County are now moving into areas that involve innovation and product development. In this area, the SACCO societies are in the forefront in mobilizing savings from the members for their credit needs. In fact, these societies are moving into areas of co-operative banking, which is locally referred to as Front Office Services Activity (FOSA).Innovation makes members to compare products between different Saccos and then go to the one with the most innovative products. Technology is made up of discoveries in science, product development and improvements in machinery, process, automation, and information technology (Manyara, 2003). It also includes a combination of knowledge, information and ideas. Manyara also observes that the rate of technology adoption and its overall application in co-operatives in the region is generally low and that the main reasons for this include conservatism, costs and ignorance. It has been found out that technology is way to improve competitiveness especially among cooperative societies and customers will go to get services from firms that have embraced technology. Saccos have been able to adapt the use of technology for example the adoption of Esacco website which is a Sacco software system that is engineered to comprehensively serve the Sacco’s clients online and the best feature about it is the fact that it has a Chat Stat application which you can chat with the admin in case you want to be offered help it is very efficient and very effective as well. The results and the situations also vary. He observed two situations where some highly automated financial co-operatives and the completely non-automated agricultural primary co-operatives. ICT is increasingly becoming an essential tool for efficient operations of investments and co-operatives should be encouraged to use this technology (Ministry of Co-operative Development and Marketing, 2008).The ministry in its policy document states that some of the cooperatives in Kenya have not embraced technology and the ones that have it have it partially. In its recommendations it states that the cooperative movement should acquire compatible computer software so that they can offer services at a more affordable rate. They also recommended that Saccos should have partnerships like Pesa point so that their members can easily access money because the Pesapoint ATMs are available country wide. Further the ministry stated that Saccos should ensure that they join CODIC so that the body can uplift the standard of computerization within the societies. Manyara (2003) notes that most of the cooperatives have not embraced fully the theory of cooperation and not only that but also most of the leaders in the cooperatives are not cooperative leaders. Manyara further observes that most of the cooperative leaders run the Saccos as though they are their own personal business and attributes all of this to lack of proper management skills. Cooperatives have been established in various sectors of the economy and thus for them to enhance growth they need to be properly managed so that growth can be seen in them..
For effective management in an organization the management should ensure that it incorporates the employees in the decision making process as well as the strategic planning process in the firm. (Marissa, 2007).Marissa further observes that if the employees are given the chance to voice out their own thoughts in the management of the organization this will in turn lead to the effective control and management of the organization. This is because the management will have already shown the employees of the organization that their input is very vital in the growth of the organization. According to Armstrong (2003), the purpose of employee’s voice is to articulate dissatisfactions, express collective organization, contribute to management decision making and demonstration of maturity and cooperative relations. He further continues to state that if employees have been allowed to voice out their concerns in the organization this will then give them motivation because this will have reduced the gap between the senior management of the firm and the junior employees of the organization. Cooperative societies require well trained managers who understand their role effectively so as to facilitate and enhance the already achieved growth. Members are required to elect their representatives for a certain period of time. The performance of these representatives is the ones who are going to ensure whether the Sacco grows or not. The problem that is associated with this is that the people who are elected to represent the members of the cooperatives are not good managers and they end up running down the societies. (Mudibo, 2005).Mudibo further observes that due to poor management skills of the cooperatives some problems arise and they include the following poor economic management and bad governance. He further notes that the agents that have been appointed to run the cooperatives are supposed to be custodians, trustees and act in the benefit of the members of the society and they are supposed to have various qualities such as be honest, integrity, efficient, responsible, diligent and prudent. This is because they need to be accountable to the members that elected them. The researcher observed during the literature review that there is a gap that needs to be filled on the factors that influence the growth of cooperatives in Nairobi County. Mbewa (2012) conducted a study to investigate whether there was a relationship between financial practice and growth of savings and credit cooperative societies wealth in Kenya. This study, however, focused on financial practice and overlooked at other variables that might have influenced the growth of cooperative societies. Another study was conducted by (Nkuru, 2015) looking at the factors that affect the growth of Sacco’s within the agricultural sector in Kenya. This study failed to look at other sectors in Kenya thus it may not bear relevance in this study. Based on this there is a knowledge gap which this study seeks to fill. Thus this study sought to determine the factors influencing the growth of cooperative societies in Nairobi County. This research sought to establish the factors influencing growth of cooperative societies in Nairobi County. This research looked at theoretical review as well as the empirical review and the objectives affecting the growth of cooperative societies in Nairobi County and finally identified the research gap. This chapter sets out a description of the research methodology. It sets out ways to evaluate the relationship between capacity building, innovation, technology, management skills and growth of Sacco’s in Kenya. Research methodology provides details regarding the procedures to be used in conducting the study, (Mugenda&Mugenda, 2003). Research methodology is a specific plan for studying the research problem and constitutes the blueprint for the proposed data collection, measurement and analysis of the data. Included in the methodology section are descriptions of the research design, the population, the sample and sampling techniques, and a description of instruments or tools used to collect data, the measurement of variables and the techniques to be used in analyzing the data.(Mutai,2000). The study is employed descriptive research design. Descriptive research according to is a (Green andTull, 1966) it is the overall pattern or framework of the project that stipulates what information is to be collected and from which source and by what procedures. A target population is a complete set of persons, cases or objects with some shared noticeable features. (Mugenda and Mugenda, 2003).The study assessed the savings and credit cooperative societies in Nairobi CBD, Nairobi County. According to the Nairobi county CBD database, there are one hundred and thirty six active cooperative societies in Nairobi CBD. The Societies are categorized according to their objectives: Saccos, Housing, and Investment cooperatives. In this study, the population will consist of all the employees of the 115 SACCOs licensed by SASRA as at 31st of December 2013. The population of the study will therefore be 1150employees. This will be arrived at by multiplying 115 that is the number of Saccos and ten employees in each Sacco.115* 10=1150. Due to the large number of population the study employed simple random sampling method. Sampling size is that part of the unit population that will represent the entire target population in any given study. (Mugenda and Mugenda, 2003).This used simple random sampling method to collect data from the employees. Sample size in the researchers’ study will therefore comprise of a section of employees from the 115 Saccos. According to Mugenda and Mugenda sample will be between (10-30) percent depending on the total target population. A sample of 10% therefore will be selected from target population using simple random sampling; this will give each individual in the population an equal probability chance of being selected. 10%/100*1150= 115 where 10% is the rate of sampling, 100 is the total rate of sampling, and 1150 is the total target population. The primary data was collected by use of semi-structured questionnaires and an interview schedule that was filled by the respondents. These questions helped to elicit the relevant evidential information for analysis upon which the conclusions were drawn. The questionnaires were distributed using the drop and pick later method. Pilot study was done to verify the reliability and validity of the questionnaires. The study involved both quantitative and qualitative data. The study examined the collected data to make inferences through a series of operations involving editing to eliminate repetitions and inconsistencies, classification on the basis of response homogeneity and subsequent tabulation for the purpose of inter-relating the variables. Once the data was collected the researcher checked for completeness ready for analysis, the go ahead to code it according to the themes researched on. Before the actual study, a pilot study was done. The questionnaire was pre-tested to a selected sample. The procedure that was used in pre-testing the questionnaire was similar to the actual one that was used in the study. This was done in order to ensure the relevance of the items to the study, gain knowledge on how to administer the instruments, and test the validity and reliability of the instruments, thus check if there are ambiguities in the instruments. The process of developing and validating an instrument is in large focused on reducing error in the measurement process. Validity indicates the degree to which the instrument measures the constructs under investigation (Mugenda and Mugenda2003). It also refers to the extent to which the instrument measures what it purports to measure. 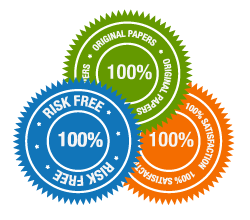 There are three types of validity tests which include content, criterion and related construct validity. Content validity refers to the degree to which the instrument fully assesses or measures the construct of interest. The questionnaire provided an adequate measure that covered the content area of the research questions. Meaning the questions in the questionnaire gave adequate answers to the research questions of the study. Reliability is the extent to which a questionnaire or any measurement procedure produces the same results on repeated trials. It is the stability or consistency of scores over time or cross rates. The reliability was measured so as to find out the degree to which the measuring items would give similar results over a number of repeated trials. A test–retest method was used to estimate the degree to which the same results could be obtained with a repeated measure of accuracy of the same concept in order to determine the reliability of the instrument. The selection of the pilot sample was done using purposive sampling. This chapter discusses the interpretation and presentation of the findings. This chapter presents analysis of the data on the factors affecting the growth of Saccos in Nairobi County a case select of Saccos in the CBD. The chapter also provides the major findings and results of the case study and discusses those findings and results against the literature review chapter. The study analysis was presented in the form of tables, pie charts, bar charts and interpretations given as below. A total of 115 questionnaires were distributed by the researcher to the respondents, all of them were filled and returned for analysis; representing 100% turn out. According to Mugenda and Mugenda (2003) a response rate of 50% is adequate for analysis and reporting; a rate of 60% is good and a response rate of 70% and over is excellent; therefore, this response rate is adequate for analysis and reporting. The researcher made use of frequency tables, graphs and charts to present data. It can be concluded that this is a good sign that respondents were ready and willing to participate in the research, which is positive for the project’s success. 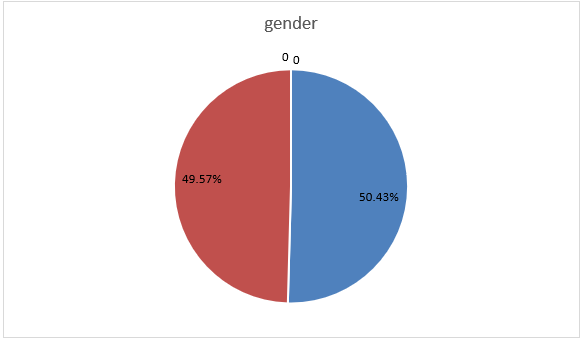 Out of a total of 115 questionnaires that were returned on gender of the respondents, 50.43% of the respondents were male, while49.57% of them were filled and returned by female respondents. It means that the study involved more male thanfemale by 1 person. It also shows that the Saccos are gender sensitive as the difference between the two genders is minimal. On age distribution of the respondents in the Saccos; the following were the results; 0% of them were between the ages of 18-20, 13% were between the ages of 21-24, 39% of them were in the age bracket of 25-29, the remaining48% of them were between the age bracket of 31-35 yrs. This can be concluded that a large number of the respondents were in the age bracket of 31-35. Concerning Level of Education of employees in the Saccos, the highest group was under University level with 47%of the respondents, this was closely followed by Tertiary level with 40%; Secondary level had 13% and lastly primary level had 0%. It means that majority of the employees in the company had University level of education; an indication that most of the employees in the Saccos are educated, something that can help in the effective management of the Saccos thus making them to grow. Respondents were required to indicate their Positions in the company, the following were the responses: 22% of them were in top level management, 55% of them were in middle level management, 23% of the remaining respondents were in lower level management. It means the Saccos have more employees in middle level management. A question was posed on the duration the respondents have worked with the Saccos, the following were the responses; 12% of the respondents had been in the Sacco for below 1 yr., 24% of them had been in the company for between 1-5 years, 37% of them had worked with the company for between 6-10 years; the remaining 27% had been with the company for more than 10 years. From the above findings, the company had more employees who had served for between 6-10 years. Respondents were required to state if they understood the meaning of the term cooperative society; 87% of them understood this term, 13% of them did not understand what the term meant. It can be said that since more than ¾ of the respondents understood the meaning of this term, it can be assumed that the term is well understood in the Saccos. In terms of the factors influencing growth in a Sacco, 73% of the respondents agreed to this, while 27% of them were against it. This therefore means that there are factors that influence the growth of the Saccos, because more than 50% of the respondents supported the statement. Respondents were asked to give their general comment on growth of Saccos in Nairobi county 47% of them said they were above average, 31% of them said it was average, 22% of the remaining respondents said below average. Therefore, that means that there is growth of cooperative societies within the central business district in Nairobi County. Respondents were required to state if they understood the term capacity building 75% of them said they understood this term while 25% of them did not understand the meaning of this term. This means that most employees in the Saccos were aware that capacity building is very vital and has indeed contributed to the growth of Saccos within the Nairobi county cbd. Concerning statements relating to capacity building and its role in the growth of Saccos in Nairobi County CBD respondents were required to state their level of agreement on statements on the same. The following were the results; 43% ‘strongly agreed with the statements’, 21% of them only agreed with the statements, 10% of them were undecided; 11% only disagreed, while the remaining 115% strongly disagreed with the statements. Therefore, it can be concluded that the statements relating to capacity building in the employees of the Saccos have positively affected the growth of this Saccos. On the general comment on influence of capacity building on the growth of the Sacco, the following were the outcome; 21% of them said that capacity building at the Sacco is very good,24% of them said it is good, 47% of them rated it as moderate, while the remaining 4% put it as bad. It means that capacity building at the Sacco is good. Respondents were asked if they understood the meaning of the term innovation in relation to growth of Saccos; 87% of them understood the meaning of the term, while 13% of them did not understood the meaning of the term in. This shows that more people understand the term. Respondents were required to state their level of agreement on statements regarding innovation and the growth of the Sacco. The following were the results; 36% ‘strongly agreed with the statements’, 20% of them only agreed with the statements, 13% of them were undecided; 15% only disagreed, while the remaining 16% strongly disagreed with the statements. It can be concluded from the statements relating to innovation in the Saccos have a positive impact as more than half of the respondents supported the statements. On the general comment on innovation and the growth of the Saccos, the following were the outcome; 40% of them said innovation at the Saccos is very good, another 30% of them said it is good, 11% of them rated it as moderate, while the remaining 19% rated it as bad. It therefore means that the innovation strategies by the Saccos are good. Respondents were asked if they understood the meaning of the term technology and how it is related to growth of the Saccos; 75% of the respondents understood the meaning of the term, while 25% of them did not understand the term and from the interpretations above, it shows that more employees in the Sacco understood the meaning of this term. 2 Reports produced by our information system are correct and accurate. Members’ issues and statement requests are responded to promptly due to technology. 5 Errors and differences in records are easily corrected, and reconciliations done on time. In terms of technology and its effect on growth of the Saccos the respondents were required to state their level of agreement on statements regarding technology in the Saccos and its effect on growth of the Sacco. The following were the results; 57% strongly agreed,16% of them only agreed with the statements, 9% of them were undecided; 16% only disagreed, while the remaining 3% strongly disagreed with the statements. It can be concluded that the statements relating to technology regarding the growth of the Sacco has positive impact as more than half of the respondents supported this. Respondents were required to give their general comment on impact of technology on the growth of Saccos, the following were the outcome 63% of them said that technology had a huge impact on the growth of the Sacco is very good, 24% of them said it is good, 12% of them rated it as moderate, while the remaining 1% rated it as bad. 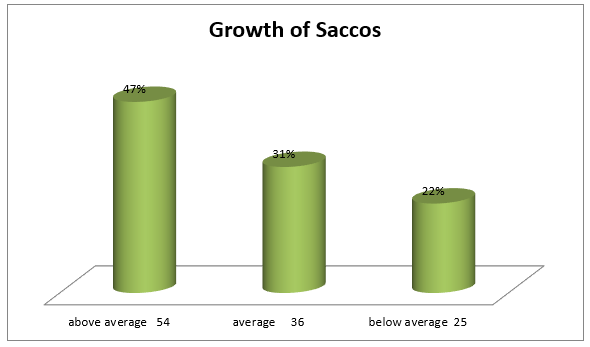 This shows that adoption of technology by the Saccos has greatly influenced the growth of the Sacco. Respondents were asked if they understood the meaning of the term management skills in relation to the growth of the Saccos61% of them understood the meaning of the term, while 39% of them did not understood the meaning of the tem. This shows that employees of the Saccos understand the meaning. In terms of the management skills of the Sacco officials, the respondents had this to say as they were required to state their level of agreement on statements relating management skills and the growth of the Sacco. The following were the results; 41% strongly agreed,22% of them only agreed with the statements, 8% of them were undecided.17% only disagreed, while the remaining 12% strongly disagreed with the statements. It can be concluded from the statements relating to management skills have positive impact on the growth of the Saccos as more than half of the respondents supported this. Respondents were required to give their general comment on management skills in the Sacco, the following were the outcome,59% of them said management skills in the Saccos is very good, 19% of them said it is good, 12% of them rated it as moderate, while the remaining 10% rated it as bad. This shows that management skill in the Sacco is good because more than half of the respondents are supporting it. This section summarizes the findings of the study and presents conclusions, recommendations and the suggestions for further research. A total of 115 questionnaires were distributed by the researcher to the respondents, all of them were filled and returned for analysis; representing 100% turn out. Therefore, it can be concluded that this is a good sign that respondents were ready and willing to participate in the research, which is positive for the project’s success. Out of a total of 115 questionnaires that were returned on gender of the respondents, 51% of the respondents were male, while 49% of them were filled and returned by female respondents. It means that the study involved more male than female by 1 person. It also shows that the Sacco is gender sensitive as the difference between the two genders is minimal. 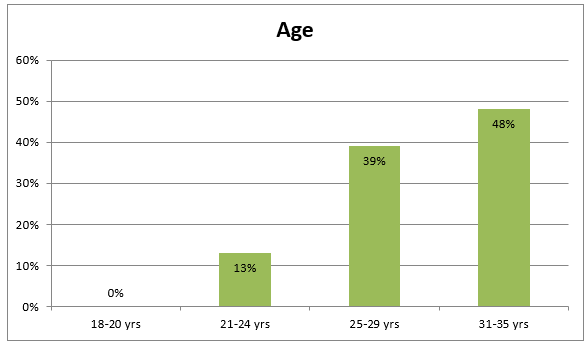 On age distribution of the respondents in the Sacco, the following were the results,0% of them were between the ages of 18-20, 13%were between the ages of 21-24, 39% of them were in the age bracket of 25-29, the remaining 48% of them were between the age bracket of 31-35 yrs. 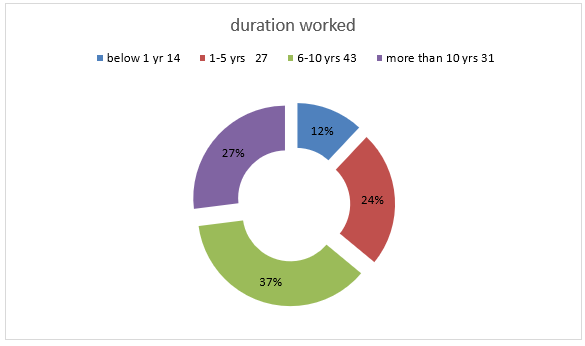 This can be concluded that a large number of the respondents were in the age bracket of 31-35. 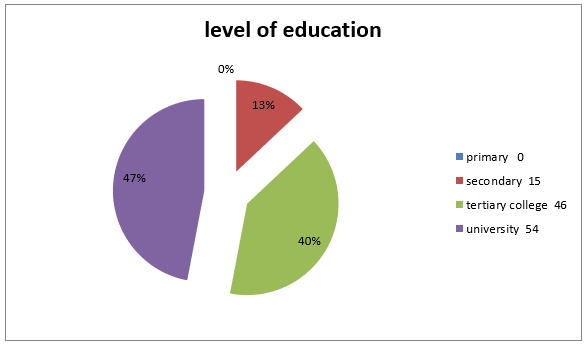 Concerning Level of Education of employees in the Sacco, the highest group was under University level with 47%of the respondents, this was closely followed by Tertiary level with 40%, and secondary had 13% and lastly primary level with 0%. It means that majority of the employees in the Saccos had University level of education; an indication that most of the employees in the Saccos are educated, something that can help the Sacco to grow. 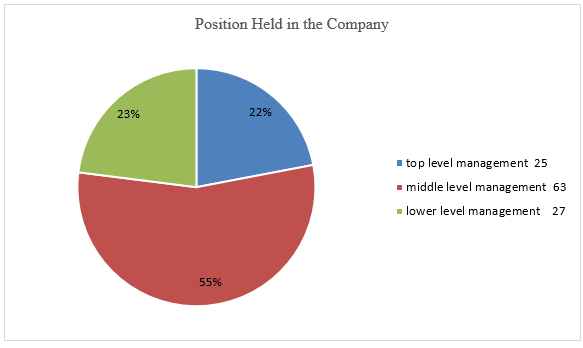 Respondents were required to indicate their Positions in the company, the following were the responses: 20% of them were in top level management, 33% of them were in middle level management, 47% of the remaining respondents were in lower level. It means the Sacco has more employees in lower level management. A question was posed on the duration the respondents have worked with the Sacco, the following were the responses, 12% of the respondents had been in the company for below 1 yr., 24% of them had been in the Sacco for between 1-5 years, 37% of them had worked with the company for between 6-10 years, the remaining 27% had been with the company for more than 10 years. From the above findings, the Sacco had more employees who had served for between 6-10 years. Respondents were required to state if they understood the term capacity building,75% of them said they understood this term while 25% of them did not understand the meaning of this term. This means that most employees in the Saccos were aware that there are other ways of generating additional income besides their monthly salary income. Concerning statements relating to capacity building of Sacco officials, respondents were required to state their level of agreement on statements on the same. The following were the results43% strongly agreed with the statements, 21% of them only agreed with the statements, 10% of them were undecided 11% only disagreed, while the remaining 15% strongly disagreed with the statements. It can be concluded that the statements relating to capacity building of the Sacco officials has positively impacted on the growth of the Sacco as most of the respondents supported it. On the general comment on capacity building of the Sacco officials, the following were the outcome; 21% of them said Capacity building of Sacco officials is very good,24% of them said it is good, 41% of them rated it as moderate, while the remaining 14% put it as bad. It means that capacity building of the Sacco officials is moderate. Respondents were asked if they understood the meaning of the term innovation and87% of them understood the meaning of the term, while 13% of them did not understood the meaning of the tem. This shows that more people in the Sacco understood the meaning of the term. Respondents were required to state their level of agreement on statements relating innovation and how it affected the growth of the Sacco. The following were the results; 36% strongly agreed with the statements, 20% of them only agreed with the statements, 13% of them were undecided,15% only disagreed, while the remaining 16% strongly disagreed with the statements. It can be concluded from the statements relating to innovation and how it affects the growth of Saccos that it has a positive impact as more than half of the respondents supported the statements. On the general comment on innovation at the Saccos, the following was the outcome; 40% of them said innovation in a Sacco is very good, another 30% of them said it is good, 11% of them rated it as moderate, while the remaining 19% rated it as bad. It means that the innovation at the Saccos is good. Respondents were asked if they understood the meaning of the term technology among the Saccos; 75% of the respondents understood the meaning of the term, while 25% of them did not understood the meaning of this term; from the interpretations above, it shows that more employees from the Sacco understood the meaning of the term. In terms of technology and how it affects the growth of the Saccos, respondents had this to say, as they were required to state their level of agreement on statements relating technology and growth of the Saccos. The following were the results; 57% strongly agreed, 16% of them only agreed with the statements, 9% of them were undecided, 16% only disagreed, while the remaining 3% strongly disagreed with the statements. It can be concluded that the statements relating to technology and growth of the Sacco that innovation has a positive impact on the growth of the Saccos as more than half of the respondents supported this. Respondents were required to give their general comment on technology and how it influences on the growth of the Sacco, and the following were the outcome; 63% of them said technology at the Sacco is very good, 24% of them said it is good, 12% of them rated it as moderate, while the remaining 11% rated it as bad. This shows that technology in the Sacco is good because it is favoring the Sacco thus encouraging its growth. Respondents were asked if they understood the meaning of the term management skills among the Saccos; 61% of the respondents understood the meaning of the term, while 39% of them did not understood the meaning of this term; from the interpretations above, it shows that more employees from the Sacco understood the meaning of the term. In terms of management skills and how it affects the growth of the Saccos, respondents had this to say, as they were required to state their level of agreement on statements relating management skills and growth of the Saccos. The following were the results; 41% strongly agreed,22% of them only agreed with the statements, 8% of them were undecided, 17% only disagreed, while the remaining 12% strongly disagreed with the statements. It can be concluded that the statements relating management skills and growth of the Sacco that effective management skills has a positive impact on the growth of the Saccos as more than half of the respondents supported this. This study aimed at determining the factors that influence the growth of Saccos in Nairobi County a case select of Saccos in the Central Business District. The results show that all these factors mentioned have an influence on the growth of Saccos, right from capacity building, innovation, and technology and management skills. Capacity building affects growth of the Saccos positively while innovation helps the Sacco to be more preferred than the others, technology helps in the ease of work of the employees and eases the access by the customers of the Sacco and finally management skills helps in effective and efficient management of the Sacco thus influencing its growth. Based on the findings and conclusions of the study, the research came up with the following recommendations, which were seen as important in determining the factors that influence the growth of Saccos in Nairobi County a case select of Saccos in the CBD; that Saccos should regularly train the employees so that they can be more efficient in the delivery of the work. The study also recommends that the Sacco officials should work very hard in coming up with more innovative products that are going to be suitable and help their customers and even sensitize more people in joining the Sacco. In terms of technology, the researcher recommends that the Sacco should encourage new technology to create new markets and technology. Also the Saccos should link with ICT providers so that they are connected to the latest computer software’s so that they can reduce on costs as well as reduce fraud in the Sacco. Also in regards to technology the Sacco should tem up with ATM providers such as PesaPoint so that members of the Sacco can withdraw their money anywhere in the country thought having to come up physically at the Sacco whenever they need to withdraw money. The study also recommends that senior and middle level managers should be taken regularly for effective management courses so that they can sharpen their knowledge in effective and efficient management of the Sacco which will thus lead to the growth of the Sacco. This study recommends that future researchers should investigate other Sacco in other counties to find out whether the same results would be obtained. Also the study recommends that a study should be carried out of the performance of Saccos rather than the growth of Saccos. Bogdan, R. C., &Biklen, S. K. (2003).Qualitative research for education: An introduction totheories and methods (4th Ed.). Boston: Pearson. Co-operative Bank of Kenya, 2013. The History of Co-operative Bank of Kenya. Crowsby, H. (1990). Customer satisfaction, loyalty and commitment in service organizations some evidence from Greece, Management Research News, Vol. 29 No. 12, pp. 782-800. Dawson,J.I. (1996).Eco-Nationalism:Anti-Nuclear Activism and national identity in Russia,Lithwania and Ukraine.Durham,NC: Duke University Press. Kobia, S. K. (2011). The co-operative Movement in Kenya: Challenges and Opportunities. Nairobi: Lukiko Consulting Trust. Kotler and Armstrong, 2004. Principles of Marketing; Tenth Edition. New Delhi; Prentice – Hall of India Private Limited. Koontz, H. and Weihnrich, H. (2007). Essentials of Management: An International Perspective. New Delhi: Tata McGraw – Hill Publishing Company Limited. Hine, M. and Kapeleris, D. (2006). Technology Strategies in the U.S. Electronics Industry: An Exploratory Study. Ph. D. thesis. Kinicki, A. and Williams, B. K. (2008). Management: A Practical Introduction. New York, NY, 10020: McGraw – Hill/Irwin. Laws of Kenya, 2005. The Co-operative Societies Act, Chapter 490: Revised Edition 2005. Nairobi: The Government Printer. Mudibo, E. K. (2005). Corporate Governance in Co-operatives the East African Experience. Conf. Pan-African Consultative Forum on Corporate Governance 2005, Dakar, Senegal. Manyara, M. K. (2003). The Development of Co-operative Law and Policy in Kenya. Nairobi: Oscan Print. Marissa, W. (2007). Types of Employee Benefits and Services; Southern California. Ministry of Co-operative Development and Marketing (2008). Investment Policy for the Co-operative Sector. Nairobi, NSSF: Ministry of Co-operative Development and Marketing. Mugenda, O. M., &Mugenda, A. G., (2003). Research Methods: Quantitative and Qualitative Approaches. Kenya: Acts Press. Pearce, J. A., Robinson, J. Richard, B. and Mital, A. (2007). Strategic Management: Formulation, Implementation and Control. New Delhi: Tata McGraw Hill Education Private Limited.